Keep your little one comfortable with Parent's Choice Diapers. These baby diapers are breathable and help keep your child's skin dry, and they offer an all-around snug and comfy fit. The printed designs on the diaper fade when wet so you know exactly when it is time for a change. Parent's Choice diapers are ultra-absorbent and offer up to 12 hours of protection. These diapers are also hypoallergenic, perfume free and latex free. 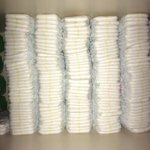 This package comes with 156 diapers, making it easy to stock up. They are ideal for little ones in stage 5, 27 + lbs. Have confidence when taking care of your toddler with Parent's Choice Diapers. Since 1998, Walmart's Parent's Choice has been trusted by parents across the country to provide quality, affordable baby products. We offer a wide range of products including diapers, wipes, toiletries, baby food, formula and baby feeding products. With a quality guarantee to back up all its baby, toddler, infant and newborn products, Parent's Choice takes care of your little one's needs for less. I Am buying more !!!!!! 10 year Parent's Choice customer! Best deal for good quality diapers. I have a 3 year old autistic son who is no where near ready for potty training, he just went up a size and I was pleased to find these for an affordable price, since Everytime a child goes up in size the package contains less diapers and sometimes is more expensive. Thanks Walmart. 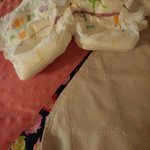 I've used your diapers for the last 10 years since my first child. I have 5. I like the different taps on the diapers. Instead on being straight the diaper extents out more and curves off then the tap. Gives my daughter a little extra comfort. I recently had to switch to these diapers because my husband and I were paying $100 a month to diaper our 1 and 2 year old. Our 2 year old has sensitive skin, so we were buying Pampers Swaddlers Sensitive. Our 1 year old wears a size 4 too, so both of our girls were wearing this diaper. We couldn't keep buying the Pampers because it is so expensive. I felt like a bad mom because it took us 2 years to find the right diapers for my daughter. I've tried every diaper out there including Parent's Choice. 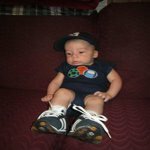 I never had a problem with Parent's Choice, but I didn't like the feel of them and I felt like maybe my kids would be uncomfortable in them. My kids don't seem to feel uncomfortable in the Parent's Choice diapers. These diapers are 16 cents a piece and I was paying 37 cents a piece per diaper with Pampers. Pampers are softer, but they're more expensive. So far my daughter hasn't gotten a diaper rash with these diapers. I will now only be spending $40 a month to diaper my kids and that's a bargain! With two kids in diapers I couldn't afford the $100 a month anymore. My family is going to save $60 monthly now and $720 annually now. If I would have stuck with Pampers I would have spent $1200 this year in diapers. We just can't afford that with our low income military family. 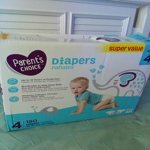 I love other items Parent's Choice sells as well as their overnight diapers, which I am a huge fan of! 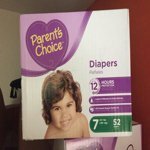 If these regular Parent's Choice diapers don't work then we will just switch to the overnights which are still pretty cheap! So far with the daytime diapers we haven't had any leaks or blowouts. I buy Parents Choice out of every other diaper because they are affordable and the hold wetness very well. I tried many other brands and they all are not perfect pampers. The only problem i have with these pampers are the straps are hard to take off. At least i know my kid won't be able to take of their stinky pamper and run around the house with it. I'm confused about all of the poor reviews. The new design is nearly identical to the newest up&up diapers. Features that are identical: Same tabs Same adherent strip in front Same elastic in the back Same wetness indicator Same size For the most part feel the same except that the up&up are very slightly softer on the outside. I have experienced pee leaks in up & up but not in Parents choice, and no blowouts in either. 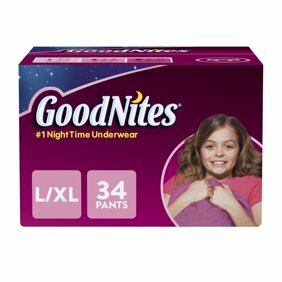 My baby drinks an 8 ounce bottle before bed and sleeps 12 hours and these hold up! This is the second time I have purchased these diapers. 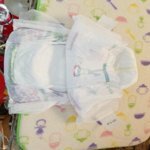 the first box was wonderful, the diapers fit perfectly and the stretch tabs were great, the diaper fit around my daughter comfortably. 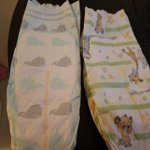 The second box was different, the diapers were longer not wider, which didn't fit as well. I'm not sure why the design changed but I definitely prefer the wider width rather than the longer width. I have no problem using cheaper stuff on our children. I thought with the line that tells you they are wet that maybe these will be like the pampers he has used since birth. We tried luvs and they do not hold the wetness. These are worse than luvs. When we change his diaper his skin is soaking wet. The diaper leaks from the top in the front and back. No, we do not leave our baby in wet diapers for hours. After he potties, we change him. The pampers kept the wetness off of his skin. They also did not leak. These wet his clothes every time he peed. We gave the rest of them away to someone about to have a baby. Your little person deserves a diaper that will not give them a rash by keeping them wet. Don't waste your money! Our son is 3 months old. Switched to these from luvs and they were thicker and great until I bought the second case. Same size same everything but the diapers in this case are suddenly drastically thinner than even luvs. I'm very irritated. No consistency.